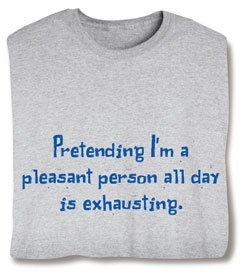 Even like the photo says, ‘pretending to be a pleasant person all day is exhausting’ people who can pretend (which is most the world who work in grocery or department stores – hey lets face it a lot of you are are faking and for good reason because some lousy customers role in there and you have to pretend with them) have more success than those who don’t put any effort in at all. Don’t believe me, shop at a Trader Joes, then go to a Walmart and tell me which experience you enjoyed better? We have to remember that the people we attract to us will reciprocate the acts of kindness and service that we have given to others. The other day, some young kids were in a store and they were short 3 to 4 dollars for some toys they were trying to purchase. They were like 10, 12 years of age. Their parents must have been in the car, so I just paid the rest for them. They were overjoyed and thanked me. A couple weeks later, I’m in a grocery store and forgot to take my cash in with me (I don’t like using debit or credit cards in stores), so I didn’t have enough to buy the milk I wanted, so I put it back. The man behind me follows me out the store with the milk. I was surprised, I thanked him and he went off into the sea of the world as I did with those kids. Anyway, being pleasant will come back to you if you put it out and if you pretend long enough, it’ll become natural. Of course if you want to learn how to be more pleasant, feel free to contact us for ideas that will suit you best! Faults and Responsibility Take One!